I love Michael J. Fox and have ever since I first saw him in "Family Ties" in 1983. Jergel's Rhythm Grille has a pretty big spring planned, with two more additions to its concert calendar. Emmy-winning actor Michael J. Fox will join the cast of ABC's "Designated Survivor" when it returns on Feb. 28. The second half of Season 2 will air at 10 p.m. Wednesdays. Fox will appear in a five-episode arc as Ethan West, a high-powered Washington attorney who is hired by President Tom Kirkman's Cabinet and then appointed as special prosecutor to investigate former President Cornelius Moss' alleged leak of classified information, according to deadline.com. Ellen Page and four other medical students take turns stopping their hearts to trigger a near death experience and get a glimpse of the afterlife. And each trip gets more dangerous as they delay their revival time . . . until they're all haunted by visions from the other side. 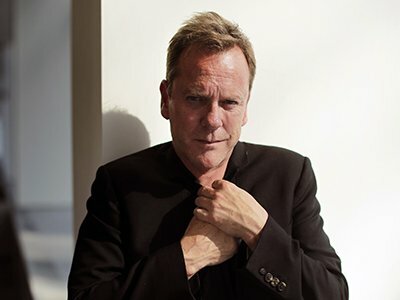 Kiefer Sutherland starred in the 1990 original and he has a cameo in the remake too. In the 1990 sci-fi/horror film "Flatliners," five medical school students — fascinated by so-called "near-death" experiences — take turns inducing clinical death in one another. After brief tastes of the afterlife, each is brought back via emergency room/code blue procedures. But the results are disturbingly compelling. After the first volunteer is dead for one minute, the next goes for two — and on and on, in increasingly protracted lengths. Kiefer Sutherland spends a lot of time contemplating what his tombstone will be like when he dies. The 'Lost Boys' actor has given much thought to which song he'd like played at his funeral, but he would definitely pick a Bruce Springsteen track because The Boss' music "encapsulates" his life. INDIANAPOLIS (AP) — "Godmother of Soul" Patti LaBelle, George Thorogood and The Destroyers and Kiefer Sutherland are among the musical performers at this year's Indiana State Fair . SHEFFIELD, Ala. (AP) — The timeless allure of the funky Muscle Shoals sound was working its magic on Kiefer Sutherland, who was in town for a gig at Singin' River Brewing Co.
"If you're into something, like auto racing, you go to the Indy 500," Sutherland said in the basement of Muscle Shoals Sound Studios. "If you're into music, this is an absolutely necessary destination." NEW YORK (AP) — Nielsen's first "most likely to succeed" list is out, and it includes Michael Weatherley, Mandy Moore, Kiefer Sutherland and Kevin James. They are among the stars in new series that performed well during the first week of the new TV season, the Nielsen company said. The best performer was "Bull," CBS' series starring Weatherley as a trial consultant in a story loosely based on Dr. Phil McGraw's life. Its audience of 15.6 million made it the most-watched debut of the week. The goal: To show how politics changes people. Working off a little-known practice – that one cabinet official has to sit out the State of the Union address in case a disaster occurs – the show thrusts a department secretary into the White House when an attack hits Washington. NEW YORK (AP) — Wherever she was, Natascha McElhone's ears must have been burning thanks to Kiefer Sutherland, who stars as her devoted husband and the inadvertent president of the United States in ABC's much-anticipated new thriller "Designated Survivor." "Aside from the way she can light up a room," said Sutherland, singing her praises, "Natasha's one of the freest actors I've ever worked with. That kind of freedom allowed me to relax a bit and put more of myself into my character." BEVERLY HILLS, Calif. (AP) — A roundup of news from Thursday's sessions of the Television Critics Association summer meeting, at which TV networks and streaming services are presenting details on upcoming programs. ABC's hit comedy "black-ish" dwells on an African-American family, but Kenya Barris, the show's creator, says he isn't interested in profiling who sees it. Say goodbye to Jack Bauer. In ABC's new fall drama "Designated Survivor," Kiefer Sutherland returns to prime time and stars as Tom Kirkman, a low-level cabinet member who is suddenly appointed President of the United States after a catastrophic attack on the U.S. Capitol. In the above video, Sutherland discusses his character and his hopes for the show. (Recorded during the Television Critics Association's Summer Press Tour in Beverly Hills). BEVERLY HILLS, Calif. (AP) — If there's a clear-cut hit on broadcast TV's fall lineup, it's likely to be ABC's political thriller "Designated Survivor."